Yesterday, we took a look at the ten players with the largest best ball ADP spikes in the week following the 2018 NFL Draft (if you missed it, you can check it out here: https://www.footballdiehards.com/fantasy-football-columns/html/Post-2018-Draft-ADP-Risers.cfm). Analyzing players’ whose price is on the rise is necessary in determining value while drafting, and naturally there is an opposite end to that spectrum. Loading up on players whose price is currently dropping, especially before training camps start and depth charts/roles become more clear, is the key to drafting players at their value. Now is the time to take advantage of these price gouges, as we still wait for the post-draft hype dust to settle. 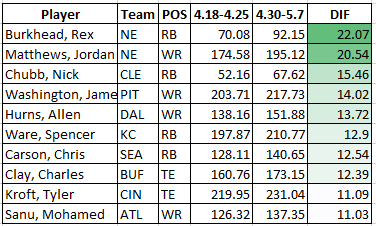 The first-round selection of Sony Michel has scared drafters to the point where Burkhead has seen his ADP drop just over 22 spots, tumbling from the late-fifth down to the mid-seventh round in the last week. Burkhead hauled in no less than three receptions per game in five of the Patriots’ final seven games. He also signed a three-year deal this offseason. With Mike Gillislee looking like a serious cut candidate and Burkhead’s receiving prowess, the screaming value on him is deafening. Running backs currently being drafted ahead of Burkhead who I would pass on for him: Aaron Jones, Duke Johnson, and Nick Chubb. Matthews finds himself slipping from the range where deep stashes are acquired to the 16th round, where many are starting to think about defense. Anyone who has been playing best ball for a few seasons has been burned by Matthews shares at this point. He tends to come cheap and rides high off of his 2014-2015 season’s with the Philadelphia Eagles. He is a serviceable WR 6/7 if the Patriots’ can find a handful of useable weeks for him, however the receiving corps in New England is crowded (and Julian Edelman is back). Whenever a receiver lands with the New England Patriots, drafters tend to get excited and acquire said player. The opposite is happening for Matthews, and the reason early sharp drafters are out on him is because of his best ball bust history. The landing spot for Chubb is not necessarily ideal, but that landing spot is what knocked him down from an early-4th to a mid-5th round pick. He is much more palatable at that cost if you missed out on any of the other vaunted rookies in this class. The Browns selected Chubb 35th overall, which is kind-of-sort-of-not-really-but-you-know-what-I’m-saying a first round pick. Carlos Hyde, who the Browns signed to a three year, $15 million contract this offseason, failed to thrive in Kyle Shannahan’s running back friendly offense last season. Todd Haley will look to make a Le’Veon out of one of these Browns’ backs, and Hyde finds himself less impressive and more expensive (early-4th round) than Chubb. I prefer the rookie’s upside to the veteran. Washington’s post-draft ADP has gone from “who?” (203.71) to “who cares?” (217.73). Sure, he can be acquired at a discount right now, but Washington very well could find himself left on the table in best ball drafts by the end of the week. If his name isn’t Antonio or JuJu, I don’t want him. Neither should you. Dallas kicked Dez Bryant to the curb this offseason and seem interested in giving this whole “receiver by committee” thing a shot. Hurns was hovering in the the 11th round prior to the draft and has dropped a round since then. Not a huge discount for the former Jaguar who has missed nine games over his past two seasons, scoring a combined ten touchdowns over that span, which matches his 2014 touchdown total. When Dallas cut ties with Bryant and Jason Witten retired, they lost a total of 219 targets from the 2017 season. During Dak Prescott’s rookie campaign in 2016, it was Cole Beasley who lead the team in targets with 92. If the Cowboys are trying to run a more “Dak-friendly” offense as they say, Beasley is about as friendly as it gets. His current ADP is 19.86 and often goes undrafted in best ball leagues. He is a dark horse candidate for my highest-owned player this season. Recent news of Ware’s knee recovery, or lack thereof, could be the factor in his slight ADP drop but Ware was already at a discount before the 2018 draft. Statistically, the RB1 in an Andy Reid offense performs well in fantasy football and we saw this last year when Kareem Hunt filled in for what could have been Ware’s role. Charcandrick West saw the coveted third down passing work, which is a role Ware should resume pending his health. Despite adding backs in free agency, Ware remains second on the Kansas City Chiefs early depth chart. He’s an ideal handcuff to Hunt, whether you cuff your own stud running backs or someone else’s. The excitement that was Chris Carson early on in 2017 has fizzled to the point where Carson, who was lost to a leg injury, now sits in the 11th/12th rounds. He showed flashes of what we are looking for in a fantasy running back with usage in the rushing and passing game. The Seahawks drafted Rashad Penny and it is a surprise Carson’s ADP hasn’t taken a larger hit. The Carson/Penny combo could make for an interesting camp battle, and both backs can easily be used effectively in Seattle’s offense. Carson will cost you a fraction of the price Penny will. Charles Clay, TE3? All day, every day, yes please. Clay has no business in the 15th round and is the only offensive weapon in Buffalo outside of LeSean McCoy worth rostering, unless of course you are interested in Kelvin Benjamin in the ninth round. Clay’s pre and post-draft cost present a situation where he is a near-lock to outperform his ADP, especially if he is eventually released by the Bills and lands on a TE-needy team (Make a call, Jerry Jones). Clay has missed seven games in his three seasons with Buffalo, yet managed to put up over 500 yards in each of those seasons. Clay saw the 14th most targets in 2017 despite missing three games and playing hobbled throughout most of the season. If he sticks around in Buffalo, he is a value in the 14th round. If he winds up with a team like the Cowboys, Texans, Jets, or any other team looking to fill the tight end void, he immediately jumps from TE3 to TE2. Another TE in the late round, another player in general who often times goes undrafted. Kroft will once again see himself in the back seat of Tyler Eifert’s wagon, however if Eifert’s lingering back issues flare up, Kroft steps right into this touchdown-heavy role in the Bengals’ offense. Handcuffing a tight end is not optimal, so I find myself splitting exposure between Eifert and Kroft. Considering the touchdown upside the role presents for both, you can acquire either at a value, as Eifert is currently an 11th round pick. The Falcons further bolstered their wide receiver corps when they selected one of the top receivers in the draft in Calvin Ridley with their first round pick. It is a wonder that Sanu’s value did not tumble further after the Falcons added Ridley. Even in a WR3 role, Sanu is an ideal best ball receiver for his 4-5 useable weeks we can expect from him. Sanu’s value figures to trend downwards, and he is a player I will want to acquire on my teams once he starts to slip down to the 13th round and possibly beyond. I am holding off on Sanu until we get some training camp Ridley hype that is sure to decrease Sanu’s ADP. Contrasting the players with the largest ADP spikes and drops in best ball is just one of many ways to analyze ADP data. In general, it is a good idea to know what players’ costs are on the rise and on the decline. Being on top of this data allows us to make conscious decisions while drafting, and helps when trying to anticipate which players will rise and fall throughout the offseason. Be sure to always check our ADP page (https://www.footballdiehards.com/adp/fantasy-football-average-draft-position.cfm), which is updated regularly. See you in the lobby!